As the Metropolitan Police Department attempts to address a decline in the number of officers, department officials say they will have to handle a high price tag to bring in new recruits. D.C. Council member Vincent Gray of Ward 7 and longtime Ward 2 Council member and Foggy Bottom representative Jack Evans proposed an increase in funds to hire more MPD officers earlier this month. Although Evans said it can cost approximately $75,000 to hire a new officer, Council members said the bill is necessary in order to reduce crime in the city. Evans said the department has only 3,700 officers, fewer than the minimum 3,800 that former MPD chief Cathy Lanier recommended. The bill would provide funds to increase the number of officers in the department to 4,200, Evans said. Interim Police Chief Peter Newsham said at a press conference that the MPD plans on hiring 360 officers this year, which would cost $27 million. The bill was referred to the Council’s Committee on Judiciary and Public Safety and is currently under review. If it passes the committee, it will move to the Committee of the Whole for approval. Evans said D.C.’s population growth and the increasing number of people visiting the city means that MPD needs more officers. He said he hasn’t heard a public response to the bill because it was recently introduced, but he believes it will pass. In his introduction of the bill earlier this month, Gray cited cuts to MPD’s personnel budget as impeding the department’s ability to support 4,000 officers and hire enough to reach 4,200. Officials cut the funding for personnel in MPD’s budget by $291,000 in fiscal year 2017, according to MPD budget documents. Second District commander Melvin Gresham, whose area of command includes Foggy Bottom, said at a community meeting in September that the department is using a program that allows retired officers to work part-time while receiving retirement benefits. 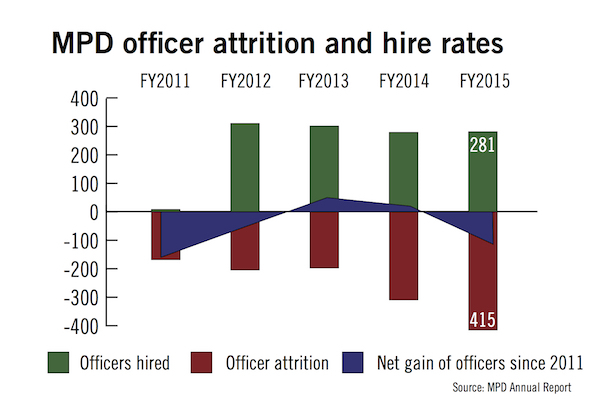 MPD lost 415 officers in fiscal year 2015 – on average almost 35 officers per month – to resignations, retirement, firings and deaths, which is almost three times the number of officers who left the department in 2011, according to the most recent MPD annual report. MPD hired 281 officers during the same fiscal year. Stephen Bigelow, the vice chairman of the D.C. Police Union, said the department is like a “revolving door” with officers getting hired and leaving soon after. The new police recruits notice the “heavy-handed” approach that MPD leadership has had in disciplining officers, which has deterred people from staying in the department, he said. “People are going in and out, and we need to address that because it’s important,” Bigelow said. Russell Mullins, the executive steward of the D.C. Police Union, said lower numbers of officers affect morale in the department more than safety in D.C.: With fewer officers, the remaining members of the force have to work overtime hours to cover the same areas, he said. Mullins said officers may be leaving the department because they are offered more benefits, like college tuition or medical coverage, in other police departments. MPD offers up to $2,400 per year for tuition, while the New York Police Department gives officers up to $10,000 annually, according to their websites. Curtis Cope, a police practices consultant at Curtis J. Cope Consulting in California, said many factors influence whether a police officer will stay with a department – notably pay and working conditions. The assaults on officers nationwide, the most prominent being the shooting of police officers in Dallas and Baton Rogue in July, are turning people off to policing.